What a Wordle of a month! Well, March may only have contained 31 days, but it provided material and inspiration for nine blogposts - that's one every three point something days, whereas my usual output is one every five - eight days. 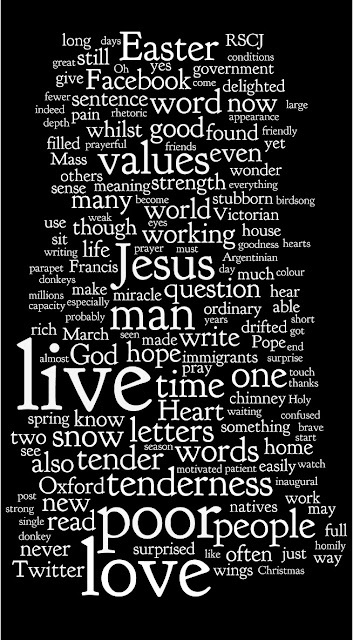 And the Wordle shows just how full and varied it's been: chimney-watching followed by a lovely Argentinian pope who speaks to us of tenderness and reminds us of the poor... while in Britain, welfare cuts and hollow values which kick the poor in the teeth... snow, frost and a delayed spring, Palm Sunday donkeys, Easter liturgies and a few other posts related to none of the above! 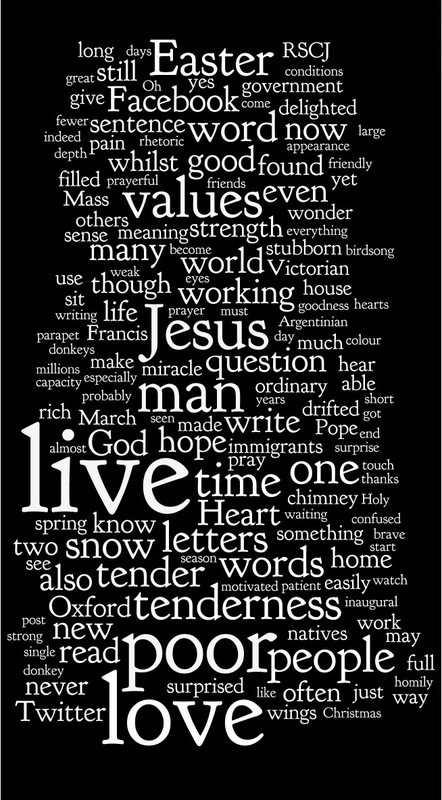 So Christmas and Easter somehow made it into the same Wordle, as did snow, birdsong and spring! The main message, though is via the three largest words: Jesus is still up there, but size-wise he's been supplanted, and instead this month it's "live poor love" - very appropriate. But there are some other lovely combinations: "prayerful values", "Jesus miracle man", "motivated patient tenderness" and...? What else do you see, to take with us into April...? I love your Wordles! Do you put in all your posts from the month? This one is really beautiful and moving. Mind you, I'm still pondering the deep message of "strong single donkey never Twitter". Is this a statement or a warning? Thanks Antonia. Yes, this year I started putting the previous month's posts into a Wordle and seeing what comes out! Apart from the fact that Wordles are things of beauty, it's a really good way of seeing what the predominant themes of the previous month have been in my writing. My friend Cloister (see blogroll) also does Wordles from time to time and did one at Easter. As she blogs recipes as well as deep themes, hers are far richer than mine in interesting juxtapositions! Parapet donkeys is a personal favorite...as is write hope, question ordinary, and God hope, live time.